Red Dog Poker is rapidly becoming a much sought-after game at online casinos thanks to a band of loyal supporters. Also known by the name ‘In-Between’, Red Dog Poker is played with a standard deck of 52 cards and is appealing due to the fact that not much skill is involved. The history of Red Dog Poker can be traced to the 1400s when card decks were first used as a form of entertainment. The French soon introduced the spades, clubs, hearts and diamonds and different poker variants were introduced over the years. While In-Between was played in 19th Century USA, it soon became redundant, only picking up in popularity again in the 1930’s under its new name – Red Dog Poker. In this game, the cards keep their face value, with Jacks being with 11, Queens 12, Kings 13 and Aces 14. The objective of the game is as the name ‘In-Between’ implies: Players place their bets and the dealer deals two cards face up, to the left and the right. The idea is to predict that the number of the next card drawn will be ‘in-between’ these two cards. Players get their money back if the hand is a tie. 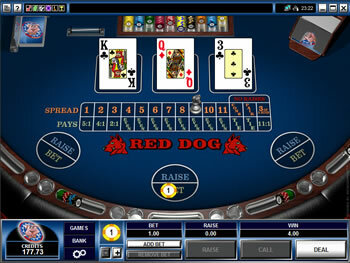 You can find out much more about Red Dog Poker by reading the detailed description of Red Dog Poker at Wikipedia.